Getting ready to sell? Don’t know where to start? At Heyler, we can help you. A good place to begin is to consider who your likely buyer will be. A single person? A small or large family? A first-time buyer, a move-up buyer an empty-nest buyers? A contractor? When you have some idea of your likely buyer, think what attributes that group of buyers is looking for in a home. Now look objectively at your home and note which of those qualities your home has and which it does not. Also, consider what qualities your likely buyer would consider undesirable in a home (such as lack of parking or located on a busy street) and note whether your home has any of those negatives. The combination of positive and negative attributes will determine the eventual sale price of your home. To the extent possible, prepare your home by increasing the positives and decreasing the negatives. Many homes are ‘staged’ before they are placed on the market. Staging is designed to maximize the home’s appeal to buyers. Staging can be as simple as de-cluttering and re-arranging furniture or as complex as a complete makeover, including new paint, carpets, landscaping and furnishing. As you prepare to market your home, visit open houses of similar properties to see how they show. These homes are your competition. To get top dollar, your house should look better than the best of the competition. Keep it clean. Spotless in fact. Windows washed, fixtures and appliances sparkling, carpets and floors cleaned, garage and storage areas tidy. Everything looks better when it’s clean. Keep it neutral. Replace your personal taste with a neutral palette. Buyers will be able to visualize their own taste better if they don’t have to see through yours. Use a few small items such as a vase of flowers, dish of fruit or pillows on the couch to add color or texture. Keep it simple. Clutter makes a property look smaller, and personal items distract buyers. Consider that a single person may have trouble visualizing themselves in a home filled with children’s toys; likewise a family may not be able to see itself in a fully tricked out bachelor pad. Keep it warm and inviting. Turn the heat and lights on before showings — buyers shouldn’t be running to their car to warm up and light is an important quality. Buyers should feel very comfortable when they are looking at your home; if they don’t, they are less likely to imagine themselves being comfortable there. Sound like a lot of work? 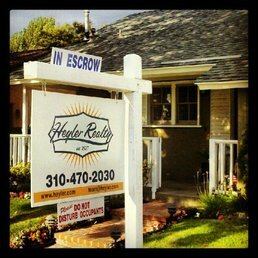 Your Heyler agent is knowledgeable about all aspects of preparing your home for sale and understands the marketplace in which your home is located. We can recommend resources for obtaining reports and can help you evaluate the options for marketing your home to bring you the highest price and best terms.